A key reason why people become entrapped in grain is because grain stored in bins is out of condition. A farmer enters the bin to break down the crusted grain and tragedy strikes, grain comes tumbling down and the person is engulfed. If grain is kept in good condition, no one has to enter the bin, reducing the risk of entrapment. Making sure that grain bins are clean and as ready as possible to be loaded with grain reduces the risk of spoilage and increases the profitability as well as the safety of the farming operation. Cleaning out grain bins isn’t a difficult task, but should be done to maintain the quality of grain. It is also a good time to inspect any mechanical components and clean up around the bin. First of all, check the area outside the bins. Any garbage or clutter should be cleaned up and properly disposed of. Garbage and other debris pose not only tripping and fire hazards, but these items can make loading and unloading grain more difficult. 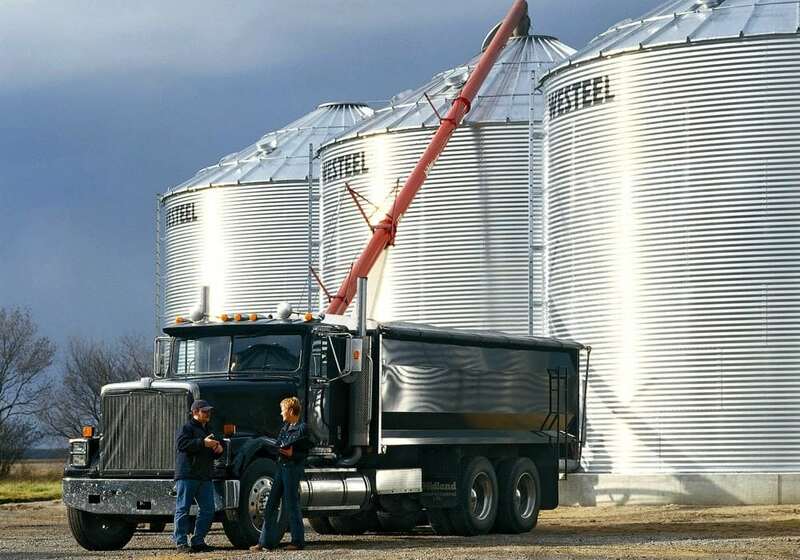 Simple efforts to keep bin areas tidy can greatly improve the safety around grain bins. Even spilled grain can pose a hazard. Spilled grain attracts rodents and insects, which in turn create health hazards through their droppings and urine. Try to keep the area free of spilled grain as much as possible. If your bin has any mechanical components (aeration systems), inspect any wiring or other components for fraying, corrosion or cracks. It’s also a good idea to check for signs of rodents in these areas. These critters can damage wiring quickly. If you do find signs of rodents, wear the appropriate personal protective equipment before cleaning any droppings or urine and take appropriate steps to rid the area of these animals. It’s essential to remember that entering a grain bin should never be done alone. A trained watch person with a means of communication (two-way radio, cellphone etc.) needs to be present outside the bin. This support person needs to have constant visual or voice contact with the person entering the grain bin at all times. Personal protective equipment (PPE) and the proper equipment should be available and organized before the task is started. A safety harness and lifeline, eye and respiratory personal protective equipment are all essential pieces of equipment. Make sure all your PPE is in good condition and fits well. This equipment isn’t just a “nice to have,” it’s essential in completing the task safely. A component of safely entering bins is performing a lock out. If the bin is equipped with a bin sweep or other moving components, the controls need to be locked out in the off position. This involves locking the controls with either a third-party lock or the one associated with the machinery. Another good idea is to write a note indicating the bin is being cleaned — that way anyone who comes by knows why the controls have been locked out. Simple operating procedures can help make tasks like bin cleaning safer and more efficient. Visit agsafetyweek.ca and check out the resources including tool box talks on topics like preparing bins, operating portable augers, transporting oversized loads and more.